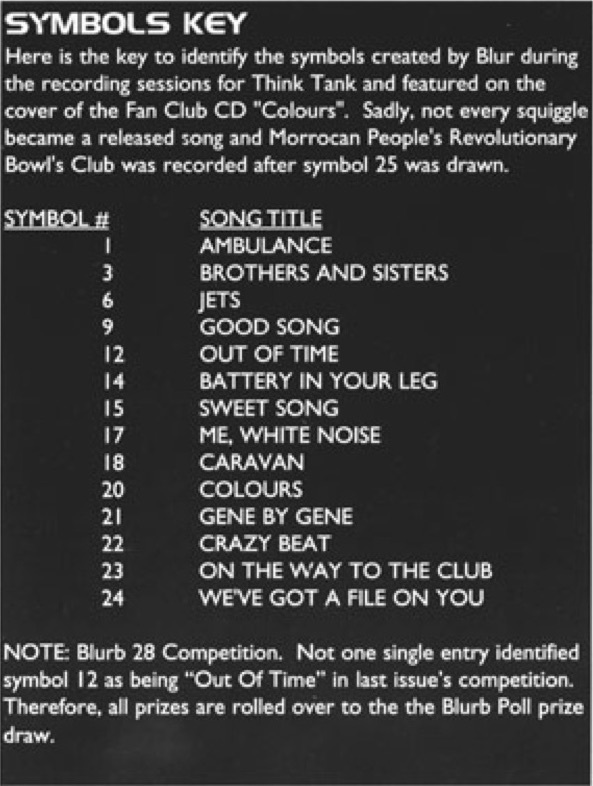 Has anyone matched the 25 symbols on the cover art of Colours http://www.vblurpage.com/discography/fa ... olours.htm with the 25 songs recorded in Think Tank era? I thought there was one with an obvious character falling into a hole, which I thought was On The Way To The Club obviously... But I cannot find it now... (3) maybe? Last guess: Jets for (11). I've never even zoomed in on this let alone realised it was a (vague) map of all those old Think Tank session songs. Unreal. I'm a bit of an unheard, unreleased song nerd. 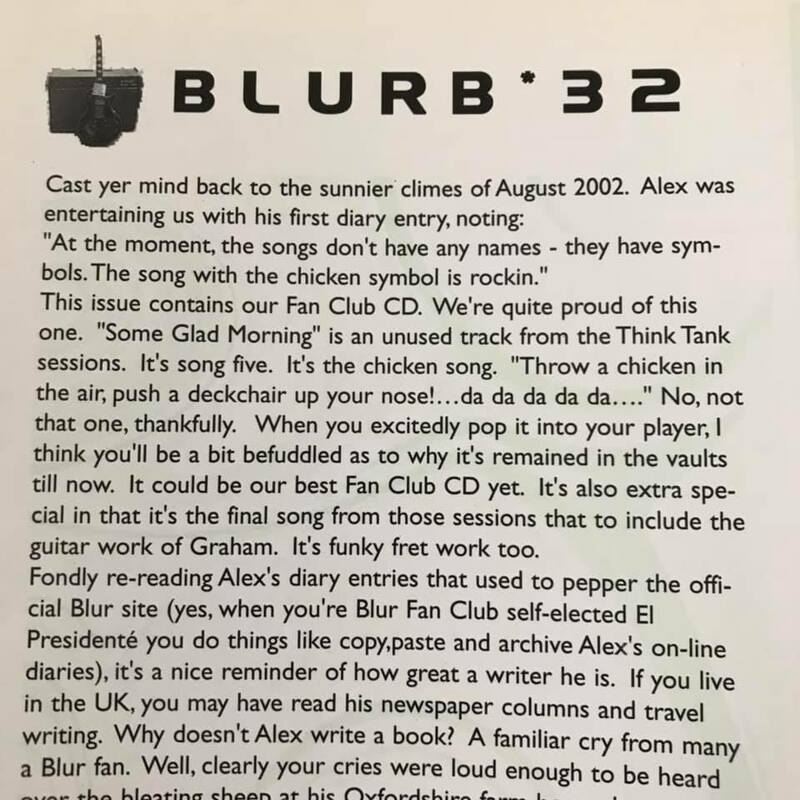 And I think we all find the time roughly before Think Tank and up until about Westway to be pretty interesting – proposed 'punk' EPs, gigs cancelled the night before, more sprawling and worldly influenced songs. Whether a lot happened or not much at all, either way there's a trove out there we will probably never get to hear or read about. Anyway, do we know any unreleased track titles from that era? Do we know the extra few songs recorded? Chicken & Fries?! There was also Saturday, unfinished (at least when Damon was talking about it in one of post TT interviews) "very commercial track"
Ahh right! It's Blurb! I vaguely remember I've seen the symbols key somewhere but didn't realise it was Blurb, thought I dreamt it up lol. Thanks! Never seen this before, cool! Seems almost like a mood chart they made for the songs early on in the sessions. I think 'Chicken & Fries' is probably what became 'Don't be'. Given the song starts with Damon repeatedly saying "chicken and, chicken and, chicken and friieess". Ah man we did this years ago. I don't think it's possible to get them all. Well spotted! It makes perfect sense. He’d said post release that Saturday didn’t make it on the album and was radio friendly (think he actually said something like it would be a radio hit). Always figured it was Some Glad Morning as that had plenty of hooks. 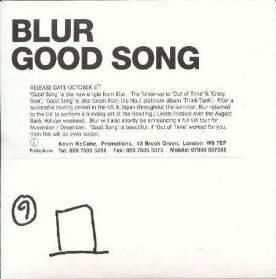 So Some Glad Morning was discussed today in Blur Fan Club Facebook group and… ta-dah! it's the chicken song! There we go then. Saturday still remains unreleased.